What can I infer if I get a high percentage of C from a protein sequence? A highly stable structure that is likely found in the extra-cellular space. Cysteine can form a disulphide bond with another cysteine. Cysteine can be found as a lone cysteine, but is often paired with another cysteine in the tertiary structure to form these bonds. Disulphide bonds play important roles in protein folding and stability (60 kcal/mol compared to around 1 and 5 kcal/mol for a hydrogen bond depeneding on the environment). Notably though, cysteine disulphide bonds are usually only used in extracellular secreted proteins, as they are unstable in the cytoplasm. As an example, take the structure 2ksk. Look at how the structure is held together by cysteines that are distant in the sequence. If you see cysteines in a sequence, expect interesting folding! The cartoon is going from blue to red, whilst cysteines are shown with sticks and the S-S bonds are in yellow. 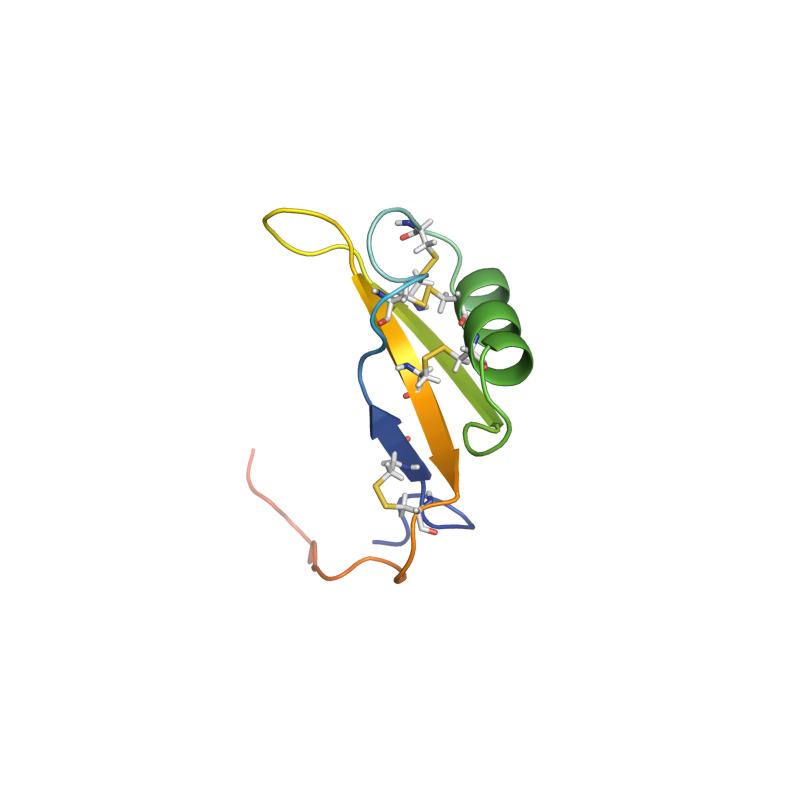 Side note, they are annotated as SSBOND in the PDB. Cysteine is one of the two sulfur containing amino acids, but far more important than the other (methionine) due to its reactive sulfydryl or thiol group (-S-H). The said sulfydryl group cannot be substituted or replaced by any other amino acid. Importance of these groups lie on the fact that they involve in the formation of disulfide bonds, the most significant cross linkage in tertiary and quatenary structure of proteins. methionine being more hydrophobic than cysteine and sterically large, acts less reactively and does not participate in disulfide formation. Cysteine can be easily oxidized (oxidative folding) to form cystine (two cysteine bound by disulfide linkage) via interchain and intra chain bonding. The bonding is covalent and adds stability to the overall protein structure as compared to H bonding (Energy disulfide bond - 60 kcal/mol, H bond - 1-5 kcal/mol depending on the environment). Therefore, energy required to break disulfide bonds are way too high than other covalent bonds. Therefore, higher the number of disulfide bonds a protein has, higher the stability of it. Not the answer you're looking for? Browse other questions tagged biochemistry sequence-analysis amino-acids protein-structure or ask your own question.